Council Member Corey Johnson still feels hesitant about proposed St. John’s Terminal development and seeks more concessions by the developer. On November 1, 2016, the City Council’s Subcommittee on Zoning and Franchises held a public hearing on the proposed 550 Washington Street rezoning and redevelopment, and the creation of a special district in Manhattan’s Greenwich Village. The proposed development would create three separate city blocks for five separate buildings which would include four mixed-use buildings and on the southern site the fifth building would be zoned for office or hotel space. Currently the four-story St. John’s Terminal Building occupies the site. 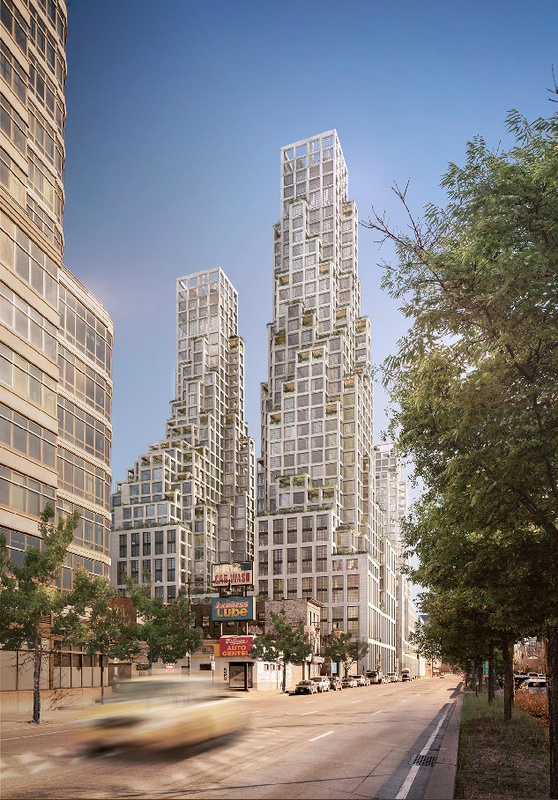 The approval of the application by the City Council would also serve as a precondition for the transfer of development rights from the Hudson River Park Trust to the developer for $100 million. The transfer of development rights would be made possible by the creation of a special district which would include Pier 40 and the development site, which was part of the application heard. For CityLand’s previous coverage click here. The November 1st hearing began with a statement by Council Member Corey Johnson who described the application as having many moving parts and that the challenges included producing an application that funded the urgently needed repairs to Pier 40, providing desperately needed affordable housing, mitigating the project’s impacts and achieving a design that weaves the development into the surrounding neighborhood. Madelyn Wils, President and CEO of the Hudson River Park Trust, spoke in favor of the creation of the special district to facilitate the transfer of development rights. She testified that the Trust had made essential structural repairs totaling $34 million, but that the Trust could not afford to repair the 3,500 steel piles that support the pier, which was estimated to cost $104.6 million. “The situation is dire,” Wils said. The pile restoration would be done by installing an outer concrete shell over deteriorated steel piles to provide protection and extend the life of the pile. The process of jacketing every pile will take an estimated four to five years because most of the work must be done by divers in the water. If Pier 40 is successfully repaired, the Trust would likely use the remaining 383,000 square feet of air rights to develop the pier. Carolina Hall, from the Department of City Planning, also spoke in favor of the creation of the Special Hudson River Park District. Hall testified that Pier 40 would be mapped as the granting site and 550 Washington as the receiving site. The special district would not encompass any other property and the mapping would not enable any other air rights transfer. The transfer is not being granted as-of-right and the developer must still obtain the special permit to successfully transfer the development rights. Rick Cook, architect for the project, introduced the design of the proposed development to the subcommittee. Cook explained that in response to community comments the proposal was amended to remove rail bed above West Houston completely opening the street. Cook also presented the hybrid plan should the City Council deny the application. The hybrid scenario would involve the same newly constructed building on the northern site as zoning already permits the proposed design. The lower two sites would be scrapped, and instead the developer would adapt the current St. John Terminal building for commercial and office space and build additional floors to reach the maximum floor area permitted, over 900,000. The hybrid scenario would not include the $100 million payment to the Trust for Pier 40. Michael Sillerman, from Kramer Levin, spoke on behalf of the developer. According to Sillerman, the development would result in 110,000 square feet of senior-affordable housing, 960,300 square feet of market rate housing, and 218,700 square feet of affordable housing. In addition, the final development would contain 222,000 square feet for commercial or hotel use, 200,000 square feet for retail use, and 772 parking spaces. In response Council Member Johnson concerns, Sillerman explained the developer’s willingness to sign the sale agreement with the Trust prior to the City Council’s vote and to put up a letter of credit for the full $100 million. This commitment was a change from the prior arrangement which would have resulted in a $40 million deposit after the City Council approved and $20 million installments over the following three years. Council Member Johnson criticized the proposed 772 parking spaces, saying, “You’re not getting 700 and something spaces, you’re not getting 500 spaces. It’s too much.” Johnson pointed out that there was a large parking garage located at Pier 40 with open spaces, and those spaces derive revenue for the park. Johnson pointed out numerous details that still needed to be worked out before a City Council vote and stated that he looked forward to working with the developer to resolve those outstanding issues. The application was laid over to the next scheduled subcommittee meeting. CC: Subcommittee on Zoning and Franchises Public Hearing on 550 Washington (LU 0506-2016; 0507-2016; 0508-2016; 0509-2016; 0510-2016; 0511-2016) (Nov. 1, 2016).